The solar corona is one of the most mysterious regions in the Solar System. The corona is basically the atmosphere of the Sun, dominated by the solar magnetic field and tenuous (yet very, very hot) solar plasma. This is one of the most compelling questions hanging over solar research: why is the corona so hot? In a nutshell, the corona is too hot. We know that the solar photosphere has a temperature of approximately 6000K, but only a short distance above the solar “surface”, solar plasma increases in temperature through the chromosphere and then through the transition region. From the photosphere to the corona (where the transition region is the lower limit), solar plasma is heated from 6000 K to over 1,000,000 K.
The mechanisms behind this coronal plasma heating has occupied solar physicists for decades (it even occupied me from 2002 to 2006). Is there a coronal heating mechanism? Is there a chromospheric plasma energization mechanism? Do acoustic waves, Alfven waves or nanoflares have a role to play? Many of these questions are slowly being answered or at least debated (my research focused on modelling coronal heating by Alfven wave interactions along coronal loops) with the eventual goal to help us predict coronal dynamics. The corona is what drives solar flares, coronal mass ejections (CMEs) and solar wind, otherwise known as “space weather”. The more we understand about space weather, the better we can prepare ourselves for the onset of solar maximum and being hit by a barrage of high energy particles (the same particles that drive the beautiful aurorae are also responsible for damaging satellites and overloading national power grids on the ground). So, to this end, Professor Alan Hood and Dr Vasilis Archontis from the Mathematical Institute at St. Andrews University, Scotland, will present their team’s results at the European Week of Astronomy and Space Science conference at the University of Hertfordshire, UK, from April 20th-23rd. Hood and Archontis have studied high-resolution XRT (X-Ray Telescope) observations of the eruption phase of a distinctive sigmoid, revealing a complex bundle of individual X-ray emitting fibrils. The S-shape is actually caused by two oppositely-oriented J-like bundles of magnetic flux and heated plasma. Interestingly, toward the end of the sigmoid evolution, the region erupted as a solar flare. 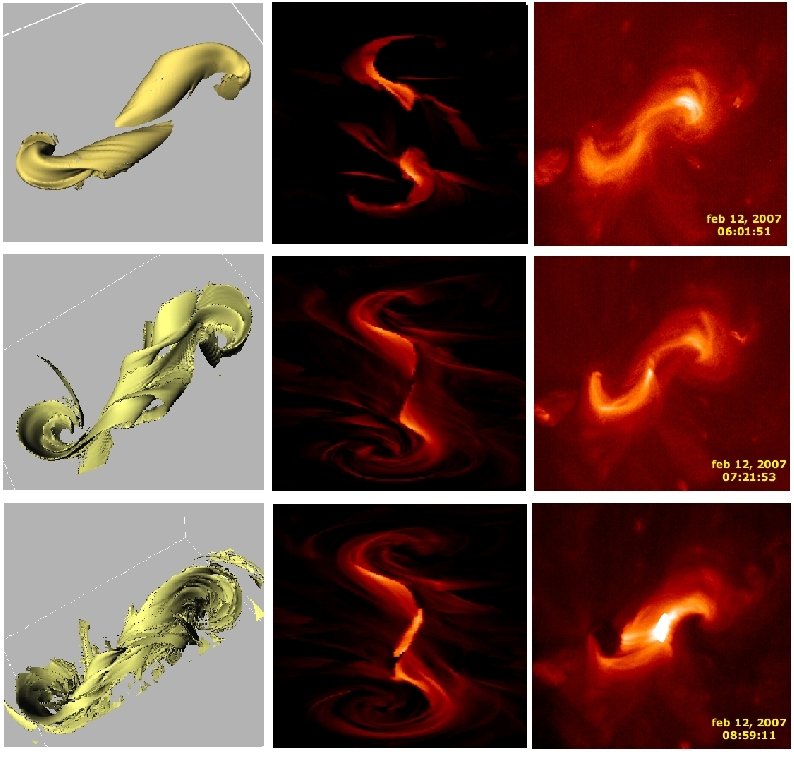 Many models have been proposed over the years, but this event provided the St. Andrews solar physicists with a unique opportunity to test an improved MHD simulation. It looks like they may be close to explaining the dynamics that drive a flaring sigmoid. “Sigmoids work as ‘mangers’ or ‘cocoons’ for solar eruptions. There is a high probability that they will result in powerful eruptions and other explosive events. Our model helps scientists understand how this happens.” — Dr Vasilis Archontis, University of St. Andrews. Prof. Hood gos so far as directly linking the dynamics of sigmoids with how the Sun affects life on Earth. “Sigmoids are among the most interesting features for scientists trying to forecast the solar eruptions – events that can disrupt telecommunications, damage satellites and affect the way navigation systems are operated,” Hood added. Looking at the output from the Hood and Archontis model, it would appear they may be close to understanding how the complex, and tightly wound magnetic field of the Sun may be influencing the dynamics of the corona. Now we have a better understanding about the underlying physics of sigmoids, perhaps we are approaching an era of better space weather prediction. The gist of it is that these appear to be rather heavy-handed electrical discharges flowing in the tenuous and highly conductive plasma of the solar corona. I might also disagree with the “tightly wound magnetic fields” bit that still seems to pervade astronomer-speak. There’s nothing to “tightly wind.” Certainly not “field lines” which are merely visualization tools denoting the strength and direction of the magnetic fields involved. “Field lines” cannot be snipped, stretched, cut, reconnected, coiled up, knitted with, boiled in a stew. When the underlying electric current changes, the “field lines” get instantly redrawn the next instant. Ask any electrical engineer worth his and he’ll set you right! Steady magnetic fields arise from steady magnetic currents. Changing magnetic fields arise from changes to those current. One might also point out that field lines are solenoidal, insofar as they have no beginning and no end. Again, no such thing as “open” field lines emanating from the sun (astronomers seem to like that one, but must be disabused of the notion); they must at some point return to complete the circuit or risk violating Maxwell’s equations! You’re right, you’re right! I was deliberately avoiding the words *electric current*. Damn, you got me, my evil plan to hide the fact the Universe is driven by electricity is foiled. Unfortunately the press release didn’t have enough information to carry out an in-depth report, so I discussed some of my views on the corona. In many studies, electrical currents are critical to the understanding of How Things Work™, but it doesn’t mean our understanding about magnetic fields or gravity (or the universe for that matter) is flawed in any way. You can quote electrical engineers all you like, but I’m not entirely sure how that relates to solar physics. I don’t see any modern peer-reviewed publications based on EU, and I can guarantee I never will. Great article! I love to see more solar physics from someone who actually understands this stuff. Can these serve as an early warning system and do they show up in other, say radio, wavelengths? My own concerns about the ionosphere have slowly drawn me more and more into learning about this. Also, I noticed you spelled “modelling.” I spell it that way, and latex spell tells me I’m wrong. The dictionary says I’m ok! One ‘l’ or two? Hi Nicole! Glad you are liking the new look 🙂 Thanks! Yes, these flaring events accelerate electrons, so you will often receive a radio signal. I’m not too sure what frequencies, but I heard the “sound” of CME radio emissions as it travelled through space; sounded like a wave crashing on a beach. As for an early warning system, I’m sure it could be used, however, you can just as well measure the X-ray emissions. I think there is less interference from other sources with X-rays, whereas radio could be noisy (especially with signals from the ionosphere as you said). The danger comes when the high energy ions come racing at us – but not all flares fire ions at us, so solar physicists are trying to detect the faster electrons before the ions cause problems later. I don't see any modern peer-reviewed publications based on EU, and I can guarantee I never will. Previous Previous post: Are Brown Dwarfs More Common Than We Thought?